Guide to Idaho Paddling . . . 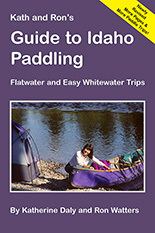 This is a companion website to the book Guide to Idaho Paddling. It includes updated info on Idaho rivers, high resolution map booklets, and more paddle trips. Ordering information for store owners and librarians. WE start this book with a mystery . . .
Somewhere out there in Idaho, there's a river. In the morning, when you first slip your boat onto the water, mist is rising from its surface. As you paddle downstream, the only things visible are the dark surface of the water, and sedges and grasses with strings of dew clinging delicately to their sides. It is quiet. Deathly quiet. The kind of quiet almost unknown in this fast-paced world. Then the sun suddenly breaks through. Within a few minutes, the mist rises and all is bright and blue and green. The river twists and turns through meadows and scattered patches of pines and firs. There are no rapids, just a few riffles. You can relax, let your guard down and gaze, enjoy, breathe deeply, take it all in. Signs of wildlife are everywhere: elk, moose, deer, beaver. Red-tail hawks soar above. Through the crystal clear water, large trout dart past the boat seeking the safety of shaded pools. It is the perfect river. The perfect place. The perfect anecdote to too many days in the city. This beautiful river really exists. The description above wasn't made up. Of all of the rivers we ran in Idaho, we both agree that this one was the most beautiful, the most refreshing and most delightful of them all. Before we say much more about the river, and the mystery, we'd like to introduce ourselves. We're Kathy Daly and Ron Watters. We're a couple of long-time Idahoans who love rivers and the Gem State's magnificent outdoors. We've been running rivers for a long time, and we hope through this book we can share with you our love for Idaho rivers and some of our knowledge about them. For years, it's been difficult to get good information on Idaho's easy rivers, the kind that you can float with a family and not worry about rounding a corner and ending up in a big rapid. That's what this book is all about. It's about laid-back, easy-going trips where you can hang a foot over the edge of the boat and wet a line, or have a fun paddle through playful rapids. We tried to provide good details, decent maps, and an easy-to-use format. Although flat rivers are not all that easy to find in a mountainous state like Idaho, we've searched them out and included runs throughout the state that you can do with the entire family. For a little fun, we've also included some spirited easy whitewater rivers. They are mostly class II, the novice range on the river difficulty scale. We ran everything in an open, tandem canoe which we found a good way to get the feel of a river's nuances and its difficulties. We hope that as you get to know Idaho through its magnificent rivers, that you'll also want to help protect these waters and the fish and wildlife which depend upon them. As Idaho grows, the demand for water and riverside lands will also grow. Rivers are no longer something we can take for granted, but something for which we have to work and fight. You can help by joining one of the river conservation groups that we have listed in the text and introduction. So where is this perfect river, the one that so impressed us with its beauty, the most beautiful river of them all? As we said, it is in this book. We could point to it and say it's on page . . . . but, well, that would be a little too easy. river and suddenly it will come to you: Yes! This is the one! Editor's Note: In this excerpt we didn't include the abundance of graphical material which makes the book so visually appealing and eminently useful when on the river. (You can find sample pages showing graphical material here.) But as you can see, the authors write in a fun, relaxed style, and fill the book with accurate and helpful information. If the word "quaint" could be used to describe a river, the Middle Fork of the Payette is the one river in Idaho that deserves it. Located 25 miles northeast of Horseshoe Bend, this quaint (couldn't resist) river is a delight to run. Flowing out of the Boise National Forest, the water is clear and crystalline. For a short distance at the beginning of this trip, the river is shaded by a ponderosa pine and Doug fir forest, but as the land unfolds, the Middle Fork flows into pasture land, and the pines are replaced by a fringe of willows. Even though you'll see quite a few homes and cabins along the first half of the trip, they don't seem to detract too much from the scenery. This is a great river to float when you are ready to make that next step from a flat stream to one with a touch of whitewater. It has a few mini-rapids, barely over a class I rating (1.3), and a few boulders to avoid. But at mid or low levels, the current is friendly, not forceful. In most places, you can stand up and walk off the river if you wanted. Moreover, in low flows, it's highly unlikely that you'll have any problem with overhanging trees or snags. In other words, if you want a lot of fun, but a high degree of safety, this is the place to go. Difficulty: Class I+ (1.3). A great transition river from flat water to minor whitewater. Distance/Time: 9 miles / 4-5 hours at 1,100 cfs. Getting to the Take-out. Crouch. Crouch is just .8 mile off the Banks-Lowman Highway. To get to the highway, drive from Horseshoe Bend (30 miles north of Boise) to the north. About 15 miles from Horseshoe Bend on Idaho 55, you'll come to Banks. Just past Banks is a sign indicating the Banks-Lowman highway. Take a right and drive about 8 miles, until reaching the turn-off to Crouch, marked with a sign. Turn left and drive .8 mile into the small, but sprightly town crouched (sorry, we couldn't resist this one, either) alongside the Middle Fork . Look for the Crouch Merc. As you face the Merc, the river is a stone's throw to the left. Near the river is a place to park and a small cut in the bank where boats can be taken out. Getting to the Put-in. Tie Campground. Tie Campground is located 8 miles north of Crouch on Middle Fork Road. Middle Fork Road is paved until the Forest Boundary at which point it turns into gravel, .2 mile before the campground. There's no ramp here. Rather, boats are carried down a short stairway to the river. The stairway must have been constructed by Paul Bunyan, since the steps are really big. You'll have to pay the campground picnic fee to use the area. Alternative Put-in. If you're wary of public land fees, there is a free put-in just upriver--and a better place if you plan to launch a drift boat. Drive up Middle Fork Road to the north (away from Crouch) another .2 mile from the campground. Here, you'll find a small road going down to the river and places for several vehicles to park. The Trip. No rapids of consequence are found on this stretch, just fun riffles and a few boulders and eddies to play in. We had a delightful time in a canoe, but it is also a fun trip for kayaks, drift boats, small rafts, and other inflatables. Short parts of it are even nice for inner tubing. Every so often, you'll come across sandy beaches and, hold on to your hat, sensually sculpted granite boulders. Bridges conveniently cross the river here and there, and with them you can pretty much keep track of your location. Besides its attractiveness, it's a good trip for bird watching. On the day we floated, we spotted an exposed snag with a disheveled mop of twigs and small branches on top: an osprey nest. With no intervening trees to get in the way, it was a perfect location from which to spy fish. Yet, exposed as it was, the nest was like an oven that mid summer day. We watched, fascinated, as the female osprey remained perched on the side of the nest and kept her wings spread to provide shade for the fledgling. Expect to find many more treats like this on the way down. Shuttle. 8 miles on a paved secondary road with a slight bit of gravel when you cross the National Forest boundary. It's a great road for a bike shuttle. Craft. Canoes, kayaks, inflatables and drift boats. Drift boats can be launched at the free access point above Tie Campground and taken out at Crouch. Neither access point has developed boat ramps, but the rutted roads to the water's edge suffice. (0.0) Put-in. Tie Campground (river right). (1.4) Mouth of Lightning Creek (left). (3.3) Elk Springs Road Bridge. (3.6) Twin Bridges. The first bridge is followed by the second a short distance below. (6.8) Rib of pine trees comes down to the river on the right. (9.0) Take-out. Crouch (river right). The above information is from Guide to Idaho Paddling and is used by permission.